Curing your own salmon is a great way to impress your dinner guests this Christmas – and a lot easier than you might think. That's why we've pulled together six amazing simple cured salmon recipes to give you some inspiration. Christmas approaches once again, and with it come dreams of golden, crispy turkey skin, crunchy roast potatoes, pigs in blankets and flaming Christmas puddings. These are the usual food tropes of Christmas (and we love them dearly), but spare a thought for the calm before the storm – the magnificent side of cured salmon that accompanies your Christmas breakfast or your pre-meal canapés. Shop-bought cured or smoked salmon isn’t bad by any means, but have you ever tried curing your own? The idea of curing your own fish sounds pretty daunting, we know, but it’s actually a very straight-forward process, and easily achievable as part of your Christmas food prep. And most importantly, the results are absolutely stunning – a world away from the equivalent you’d buy in the shops. Have we convinced you to give it a go? 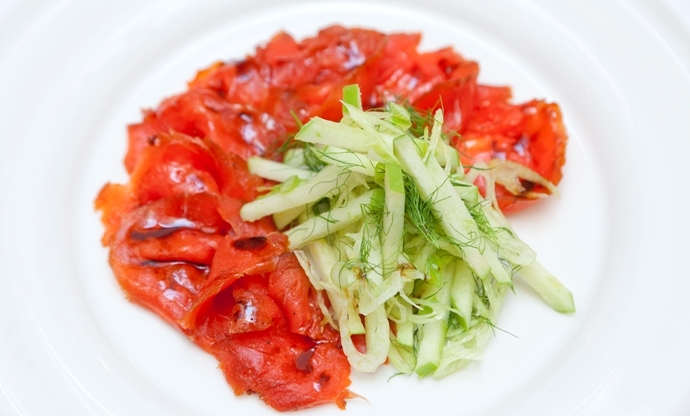 We'e rounded up six stunning cured salmon recipes from renowned chefs like Nathan Outlaw, Andy McLeish and Pascal Aussignac, all of which are guaranteed to delight your dinner guests. Once your salmon is cured, you can use it however you like. Make it part of an elaborate starter, serve it with scrambled or poached eggs, or just slice it thinly and drape it over a cracker with a squeeze of lemon and a touch of black pepper. We couldn’t really write about curing salmon and not include Nathan Outlaw. 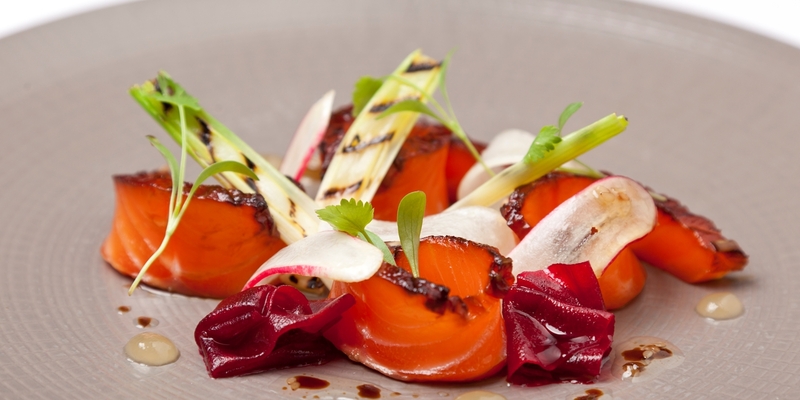 Nathan is a superb chef with exemplary touch when it comes to fish cookery, and his beetroot-cured salmon is a favourite in his restaurants. Making the salmon really couldn’t be easier – just peel your beetroot and slice roughly into cubes, then blend it together with the rest of your sugar, salt and spices to make your cure. 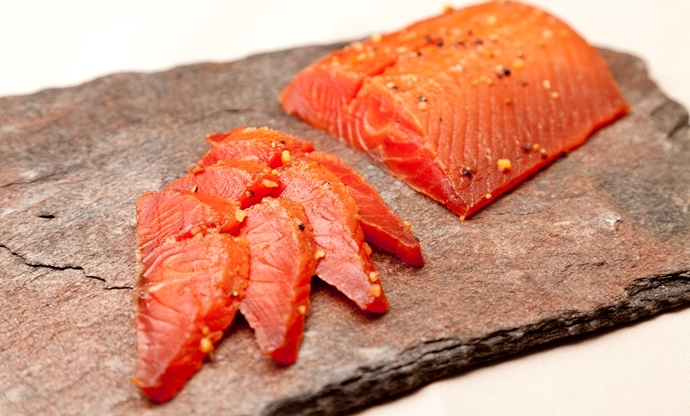 Trim up your salmon, pour your cure over it and wrap it up nicely in cling film before it goes in the fridge. It needs a good day and a half to cure, but after that it will sit in the fridge happily until you need it. 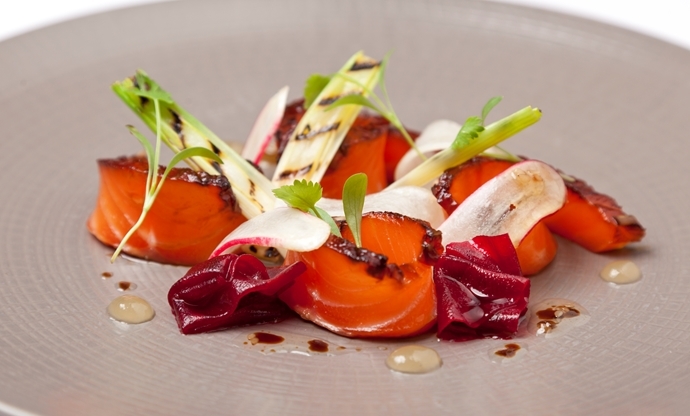 Andy McLeish’s treacle cure takes inspiration from the Far East, using soy, ginger, chilli, lemongrass and lime leaves to give his salmon a rich, complex flavour. His recipe is slightly more technical than Nathan’s, and it takes the best part of a working week from start to finish, but the results are seriously impressive. Andy cures his salmon in a salt marinade for twenty-four hours to get it started, then washes it off and slathers his salmon in his sticky treacle cure for another four days. 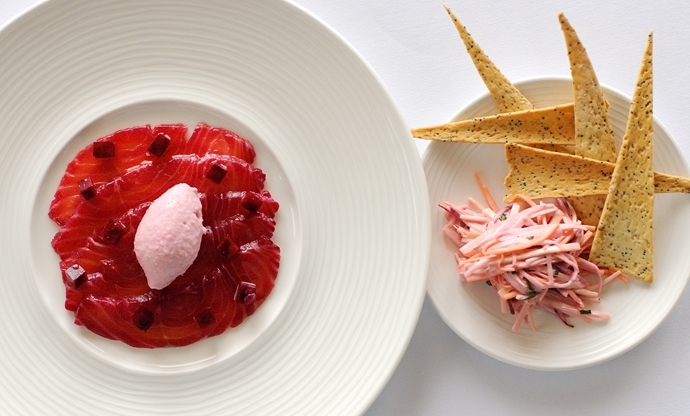 This recipe from Simpsons' chef-director Luke Tipping is more classic – Luke goes heavy on the citrus and juniper to give his cured salmon a Christmassy feel. The flavours may change but the method remains the same, or at least, very similar. 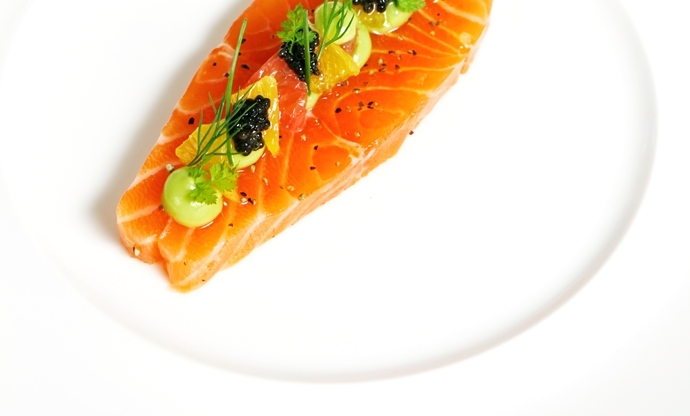 Luke blitzes his juniper berries with salt, sugar, peppercorns and dill, and covers his salmon evenly in the cure, as well as slices of orange and grapefruit. The salmon should be ready after a day in the fridge, but Luke recommends chilling it for a few more hours after you wash off the cure. 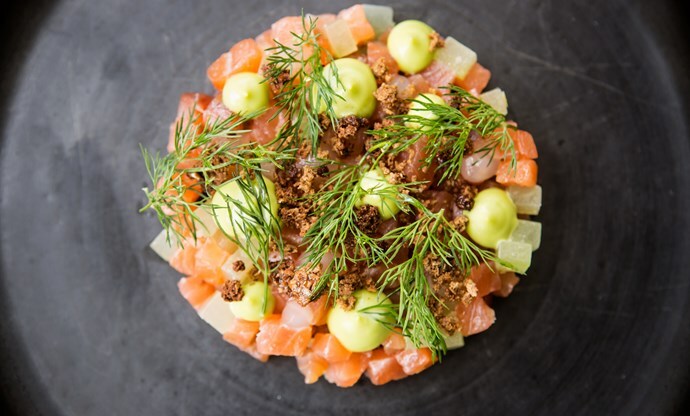 With compressed cucumber, tonic gel, pickled lemons and dill mayonnaise, Paul Welburn’s technical starter looks intimidating, but the gin-cured salmon component is remarkably easy. Paul toasts his spices and blitzes them with lime and lemon zest, dill, sea salt and spices, before folding through the rest of his salt, sugar and gin to create his curing mix. From there, just cover your salmon with your cure as normal, wrap your fish in cling film and cure for ten hours until firm. Easy peasy. Pascal Aussignac takes a slightly different approach to curing his salmon, but the method is just as effortless. Rather than curing his salmon from the outside, Pascal makes a brine with rock salt and water and brines his salmon for half an hour, allowing the salt to permeate into the fish. After drying the salmon with a cloth, he covers it in maple syrup and allows it to cure for six hours, giving it a turn halfway through. The result is a lovely sweet cure – perfect alongside some fresh, crusty bread and a dollop of horseradish. William Drabble’s cure is rich and warm, striking a fine balance between sweet treacle and earthy, fiery whisky. He starts off by grinding down his spices – fennel and dill seeds alongside salt and pepper – and generously coats his salmon in the dry cure, finishing it off with the whisky and treacle. After a solid twenty-four hours wrapped up tightly in the fridge, the salmon should be ready – just wash off the cure as usual and pat it dry.